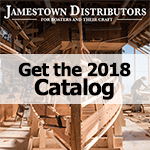 Jamestown Distributors offers fine quality power tools from brands like Fein, Festool, Turbinaire, and Nikota. Our power tool line contains most woodworking tools like cordless drills, circular saws, orbital sanders, shop vacs, as well as some top of the line products. We are distributors of the Fein MultiMaster, the Festool Rotex Sander, the Turbinaire 1235 HVLP paint sprayer and the EC Cutter electric scissors. All of our power tools are backed by a manufactures' warranty. FEIN high-performance power tools are synonymous with quality and precision. Leading design facilities produce power tools of ergonomic design. Safety and environmental concerns, along with durability, and economic operation, have enabled FEIN's success as a producer of World Class power tools. With manufacturing facilities in Germany, FEIN has subsidiaries in Switzerland, Great Britain, France, Canada, South Africa, Australia, and many other countries. All Festool equipment ships direct from the manufacturer within two days. There are Festool warehouses on both coasts to get your tools in hand on time. Most orders arrive within two business days. Festool grants a 3-year warranty on all electric tools, provided they are operated correctly. (Not applicable for wearing parts.) Not only is it one of the longest in the industry, it's also the strongest.